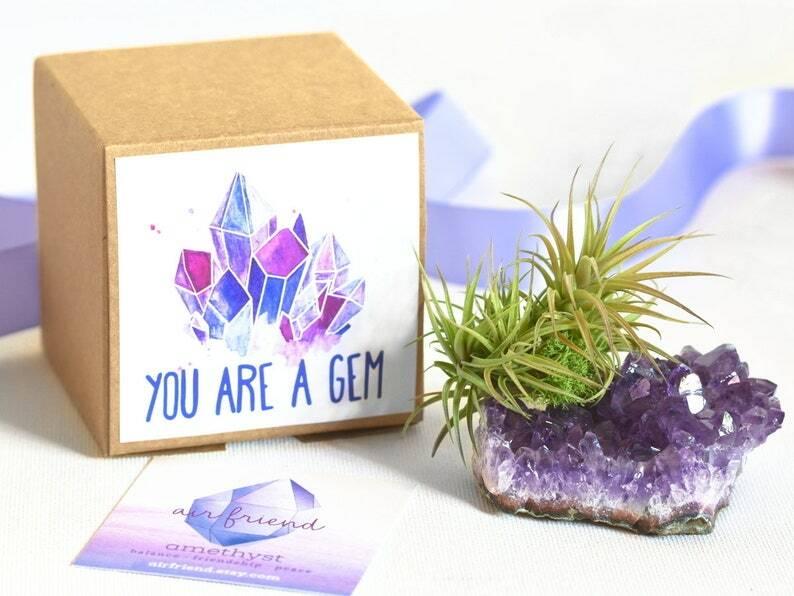 Tell your friend what a gem she is with this beautiful amethyst crystal air plant garden! This cute gift comes with a free personal note printed on a mini kraft card. *** Please send me your personal message upon checkout if you wish to include one. 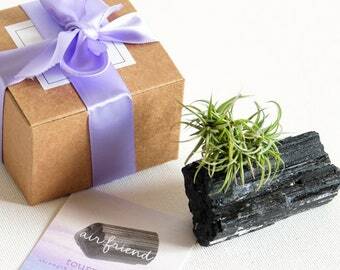 The air plant (tillandsia) is mounted on the amethyst crystal with plant safe adhesive. Air plants love to be indoor with some indirect sunlight and good air circulation. Home and office fluorescent lighting are great too if there aren't windows nearby. Mist it a few times every week and your air plant will flourish for many years to come. 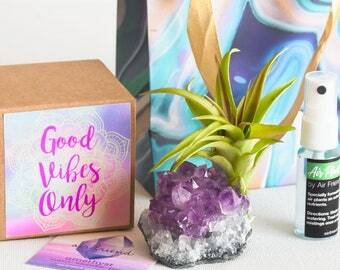 This amethyst crystal air plant garden is truly one of a kind. No two air plants and crystals will look the same in nature so please expect some variations. These are natural live air plants and it's normal to have some dried tips, broken tips, and difference in coloration. This is normal and not considered defect. 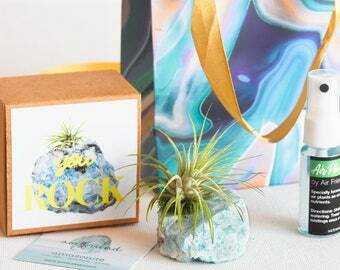 Optional add-on: "Add Gift Tote + Food"
Growing air plant is fun and easy! 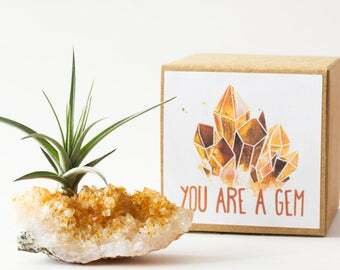 Unpack your air plant when you receive the package. 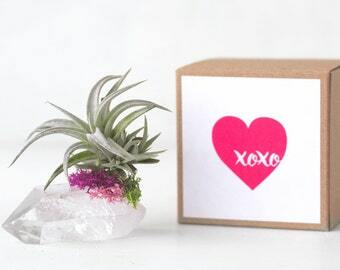 Follow the air plant care guide inside the box to get started. This crystal air plant will do well anywhere indoor with indirect sunlight and good air circulation. Home and office fluorescent lighting are great too. Mist it a few times every week and your plant will thrive indoor! Air plant food instructions: mist ~2-3 times once a month after watering. Add ribbons for up to 3 gifts Choose "Add Gift Tote+Food" before adding to cart to get plant food and gift bag. Plant food not included otherwise. So cute. My sister loved it. Thank you so much! Terrible quality and no consistency. Received a brown amethyst not purple. Plant came dried out and barley alive. Contacted the shop- Customer service was so poor. They wouldn’t refund me and kept hitting auto reply response to the same thing it says in the description. I emailed several times and they won’t give me my money back without ME paying to ship the item back. Do not buy from this seller unless you want to risk what I did. Bought it as a gift for my friend and she loved it! 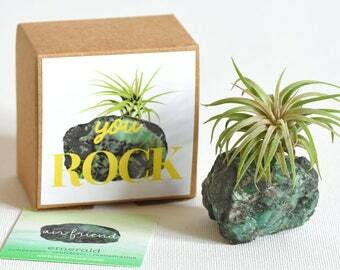 Do you offer a 30 Day Guarantee on the air plants? Yes I do. Air plants are very hardy and this rarely happens. 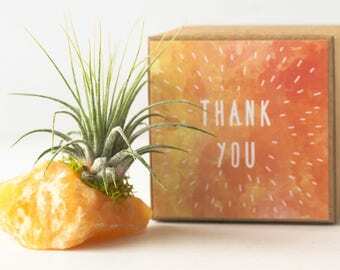 But in the off chance that you air plant is dead on arrival you can contact me within 30 days of receiving the shipment and send me back the item. I will gladly replace your plant for free. Buyer only needs to cover shipping. Do you offer combined shipping discount? I offer combined shipping discount on all items in my store. Please message me for discount details! ***Shipping time update: Orders placed after 12/11 will most likely arrive after Christmas. USPS does not guarantee arrival before Christmas for all orders placed after 12/11. Most U.S shipments take 3-5 business days via USPS First Class Mail and 1-3 business days USPS Priority Mail. Please allow additional time for delivery to Alaska, Puerto Rico, Hawaii, other U.S Territories, PO boxes, or APO/FPO addresses. I will also send you a USPS tracking number for every purchase. You can track your package on USPS's website. Keep in mind that it can take 24 hours for the tracking information to update. What if my item is missing in the mail? I include a USPS tracking number for every purchase. Try checking the status of your shipment at usps.com/tracking first. If you still can't locate your package, please feel free to message me and I'll help you track down your package. This rarely happens but I understand how frustrating that can be if it does happen to you. Please keep the damaged item and packaging and send me pictures of the damaged package within 5 days of receiving the item. I will file a case with the carrier and replace your order promptly for free. Buyer only needs to cover shipping. Can I return a live plant gift? Returns are typically not accepted since these are live plants. If buyer and seller agree on arranging for a return, item(s) must be returned within agreed upon time frame. All item(s) returned in original condition may qualify for a full refund on the item(s). All item(s) returned not in original condition (ex. plants withered/ plants missing/ crystals damaged / packaging missing, etc.) would qualify for a partial refund of up to 50% of the original value. Buyer is responsible for return shipping. Original shipping is not refundable since USPS does not refund shipping on packages marked as delivered. About how long can I keep the plant inside the box? These are live plants and we highly recommend taking them out of the box for some water and light as soon as possible upon receiving the package.